Really? The "Legends Showcase" DLC adds 135 new players? That's gotta be a typo. As of this morning, 2K Sports announced the aforementioned, upcoming Legends Showcase downloadable add-on for its excellent NBA 2K12. 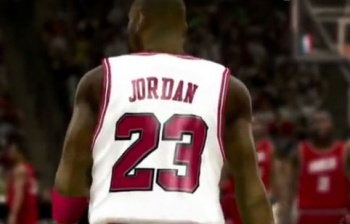 Now, as far as sports games go, NBA2K12 is one of, if not the best, both from a gameplay and content perspective. That's why I'm kinda bewildered at the sheer amount of stuff 2K Sports has promised for this as-yet-undated $10 DLC pack. Legends Showcase creates a truly unique basketball experience for all fans, featuring a new, cell-shaded art style set in New York City's iconic Time Square. This downloadable add-on enhances NBA 2K12 by providing a never-seen-before gaming experience, unlocking hours of additional gameplay and giving fans an all-new way to end the debate over who is the greatest basketball player of all time. Legends Showcase allows gamers to select from more than 150 of the NBA's all-time greatest players, including Michael Jordan, Larry Bird, Magic Johnson and Dr. J, and compete in authentic pick-up games from 1-on-1 up to 5-on-5. Legends Showcase also features mini-games, such as 21 and H-O-R-S-E, along with other new features like the 2-on-2 Teammate Challenge and 3-on-3 Era Challenge. Gamers can also unlock current NBA players to create unique match-ups between legends and current stars. Finally, for the ultimate challenge, gamers can bring their My Player into the mix and battle the legends of the NBA to see how they stack up against the best ever. As an added bonus, Legends Showcase also includes Classic Quick Match, a new mode that is opened up in the main game allowing gamers to play online with the NBA's Greatest teams in a regular simulation setting. Honestly the new gameplay modes and cel-shaded Times Square court are pretty impressive inclusions, but the really striking part is that line that reads, "150 of the NBA's all-time greatest players." The original game featured 15 of the NBA's classic stars, so this DLC is going to add 135 more? That seriously can't be right, can it? If it is, I'm going to be wildly impressed by 2K Sports' dedication to creating the greatest basketball simulation in history. We've sent an email to 2K Sports to find out if that figure is for real, but until we hear back, I think we can amuse ourselves by speculating on who might be among the additional 135 players. I've got my fingers crossed for Clyde Drexler and Charles Barkley, but there's also a part of me that wants to see Bill Laimbeer added to the game's roster. Double points for 2K if Mr. Laimbeer is sporting his metal armor.